Up there in search term popularity, in the upper echelon of cat videos and Trump antics, are questions about travel—flights, hotels, tourist attractions—and they flood Google every single day. Google even says these kinds of queries have increased every year for several years, and that’s why Google is improving those results with Destinations on Google. Whether you’re on Android or using the Google app for iPhone, you actually already have the feature, Google’s been secretly pushing out the update over the past couple weeks. Search “European destinations” or whatever area of the world you’re interested, and up pops a huge selection of could-be vacations. The layout at first glance looks somewhat bare bones, but when you start combing through all the tucked away settings, things get detailed. You can search vacations by price, dates (exactly or a more “anytime in this month,” devil may care way), and interests, like sailing, hiking, culture. If you pick nothing, Google will index across several months to see when is the absolute cheapest time to travel. Once you choose one of any 201 currently indexed cities, and up pops estimated flights costs, possible hotels, areas of interest, touring videos of the city, and you can start planning your trip right in Google. If you want to do several destinations, Google serves up tours of entire countries picked from the search engine’s massive amounts of travel data through Google Hotels and Google Flights. But with the multi-headed hydra that is planning an overseas vacation, Destinations on Google comes with a few blindspots. For one, Google doesn’t incorporate any kind of alternative room accommodations like Airbnb. The feature also doesn’t handle multi-city vacations—like flying into one city then flying out of another—incredibly gracefully. 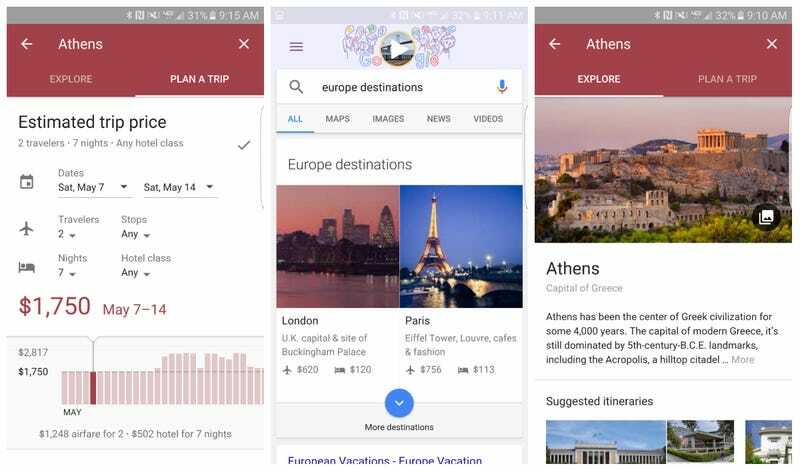 But Google says its new travel tool isn’t supposed to be the be-all-end-all travel tool on your smartphone. The app’s meant to help make those off-hand Google queries become actual globe-trotting adventures.